Post-Traumatic Stress Disorder (PTSD) is a disease that affects millions of Americans, with me included in that number. Often, media, including TV, film, theatre, books and comics, are unwilling to tackle issues surrounding PTSD, and in cases where they do, they often shed a negative light on it as was done in Breaking Bad with Hank. Think Tank: Fun with PTSD flies in the face of both of these conventions. Not only does it deal with PTSD, but it does so in an educational and honest manner. I have never read a comic book where I felt the writer was so in tune with my feelings. Thankfully, Matt Hawkins did his research and delivered a book that I am sure with not only educate those who have never experienced PTSD, but also entertain. 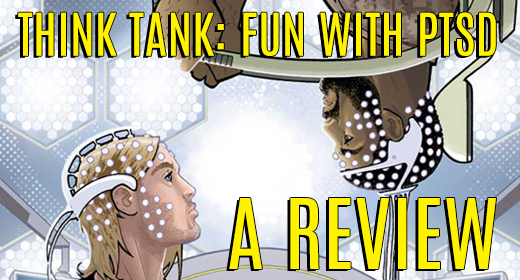 Think Tank: Fun with PTSD is one of those comics that attempts to do more in one issue than most books do in entire arcs, and it succeeds with ease. The story starts out with Dr. David Loren entertaining young cancer patients with a nice comical bit, but it takes a turn for the serious when Loren sees a soldier, Petty Officer Morgan, who had once helped Dr. Loren in the main Think Tank series, being escorted out of the hospital. The soldier was being arrested for killing his wife. Turns out Petty Officer Morgan has PTSD and was having a dissociative episode when he killed his wife. This sends Dr. Loren on a quest to better understand PTSD so to find a cure for Morgan. There is no action. There is only drama and knowledge to be found in this book, and Hawkins provides a great balance of both. In all reality, this is a book for intellectuals, though I am sure anyone could enjoy it, since the problem in the story is something that so many people deal with. Hawkins seems to understand the inner workings of PTSD and expertly relays them onto the page. Dr. Loren’s quest for information about the disorder, becomes our quest, making the book just that much more personal. This book works in almost every way. It sets its goals early and achieves them in a very satisfying manner. While there is not much bad to be said here, I do feel the book could over the head of the less intellectual or less emphatic crowd, though I do not understand how anyone could read this book and not feel at least some empathy with either Dr. Loren’s quest to understand PTSD or Morgan’s struggle with it. Overall I give the book a four out of five stars, though it very nearly hits that fifth one. This a must buy, regardless of its minor problems. Thanks for post this very illuminating article, Dan! I look forward to reading more about your experiences with GM:S publishing and wish you the best of luck with SuenJBpaerump and future projects.